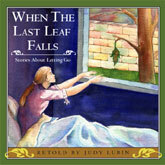 The beautiful, poignant stories told in When The Last Leaf Falls focus on loss, forgiveness and letting go. While most of the tales deal explicitly with death, they all do so in a way that paints death as a metaphor for the difficult part of change, which is detaching from the old so as to make room for the new. These stories are perfect for helping children to mature past each stage of childhood and to recognize that loss is the first step towards growth. When The Last Leaf Falls; The Lost Princess; Godmother Death; The Two Brides; The Selkie. Best for ages 8 and older. Waldorf Homeschooling Best for Grades 2 and 3.